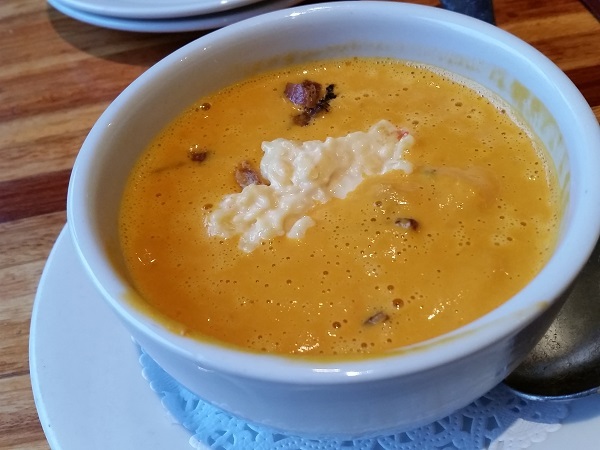 Kaleidoscope Bistro & Pub, Brookhaven GA (take two) – Marie, Let's Eat! Marie and I were invited to revisit Kaleidoscope a few weeks ago to sample their new wood-fired pizzas. I confess that I raised an eyebrow when the restaurant first announced that they were adding pizzas to their lineup, but each time we’ve gone to Kaleidoscope, it has been to have their truly amazing burger, which is among the very best in the Atlanta area (Hat tip to Todd Brock for originally sending us in to try one, by the way). I genuinely have not looked at anything else on the restaurant’s menu, as the burger is that good. It took an unusual circumstance to get me to waver from my routine! We arrived just ahead of some rain that had been threatening, and enjoyed a couple of appetizers. Their creamy tomato bisque soup is a rotating special and might not always be available, but definitely have a cup if it is. What a wonderful soup! The crumbled bacon was a very nice touch. 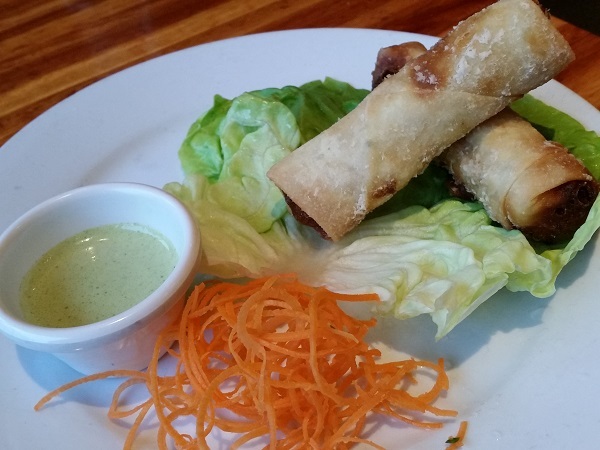 We also really liked the curried chicken spring rolls. I’ve never seen these on anybody’s menu before. (I’d never seen them on Kaleidoscope’s, because, again, I’m usually here for just the burger. [smile]) These are incredibly flavorful, with just a pop of tamarind in the mix, and are served with a cilantro yogurt dip. But we were here to try the new pizzas, which are baked in an oven from Washington’s Wood Stone. They have eight pizzas on the menu, plus a build-your-own option, along with some rotating specials. Marie ordered the “Lando” pizza, which is their version of a meat lovers’ pie. This always amuses me when Marie does this. Nobody loves fresh vegetables as much as she does, but ask her what she wants on a pizza, and it’s nothin’ but meat. The Lando comes with pepperoni, fennel sausage, and soppressata salami. It’s a very, very good pie; if you enjoy pizza once a week, this would certainly do just fine. The crust is balanced just right, a little chewy with a light char underneath. The meats are salty but not overwhelmingly so. I would have considered building a veggie pizza myself, but Marie’s order was just fine, and instead I sampled the evening’s special. My pie, while pretty amazingly fun and quirky, was probably not an every week pie, but maybe once a month. 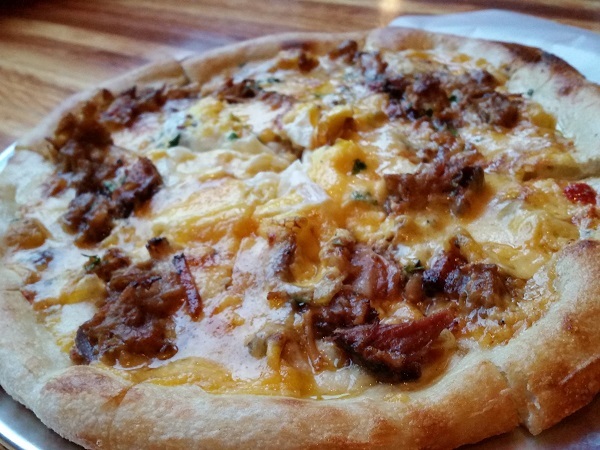 Get this: it’s a “Carolina pulled pork” pizza. Now, sure, lots of places offer a barbecue pizza. They’re most likely following the lead of California Pizza Kitchen; that chain lays claim to popularizing barbecue pizza in the mid-1980s. Coletta’s in Memphis did it first, decades earlier, but a Memphis barbecue pizza is very different from a CPK-inspired one, which is what you often see in restaurants. Anyway, Kaleidoscope’s is not like either; a typical barbecue pizza offers oven-roasted pork, and a mildly sweet Kansas City-style brown sauce drizzled over the toppings. That’s not what they do here. For starters, the pork is actually slow-smoked on a Big Green Egg. Then the pizza is not made with tomato sauce or a sweet brown sauce, but rather a Midlands-style mustard sauce. I have never seen anything like that before. Add some bacon crumbles and a fried egg in the center and the result is pretty tasty, and playfully silly. It’s a novelty, a stunt pizza to be sure, but it works. No, I wouldn’t want one every day, but I recommend that you keep an eye on Kaleidoscope’s social media for the next time they roll this thing out. It’s definitely worth a try! Now, right across the street from Kaleidoscope is another pizza place. Because I’m a troublemaker, when Kaleidoscope’s manager, Jared Reisman, stopped by our table to check on us, I wondered whether that restaurant had bristled a little bit when the wood oven was installed. They did respond by broadening their menu, and now offer wings and sandwiches. Competition can be a good thing; it keeps you on your toes. The pizza is definitely above average for Atlanta, and our city’s pizza average is pretty darn high. But Marie was more taken with her pie than I was. 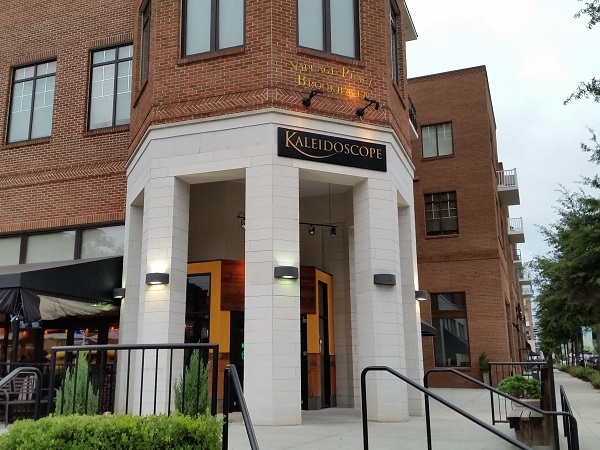 For me, Kaleidoscope remains a must-visit for their burger, which is way, way above average for Atlanta, but which Marie doesn’t enjoy as much as I do. Now we’re both completely pleased. We talked briefly with Jared about how much I like the burger, and how it’s actually going to move up a rung in my own “city’s best” ranking when The Brickery, home of the astonishing Caesar Burger, closes next month. It turns out that Jared once worked at the Brickery himself! What a small world. We talked about what a shame it is that the Brickery will close, and how the best thing that can happen for restaurants like Kaleidoscope is to become both a constant in the neighborhood with locals who can walk over for a good meal, and at the same time draw interest from across town with really good standout menu items. Seriously, keep up with Kaleidoscope’s specials, because they’re fun and incredibly tasty. Try their pizzas, too, and let us know what you think! 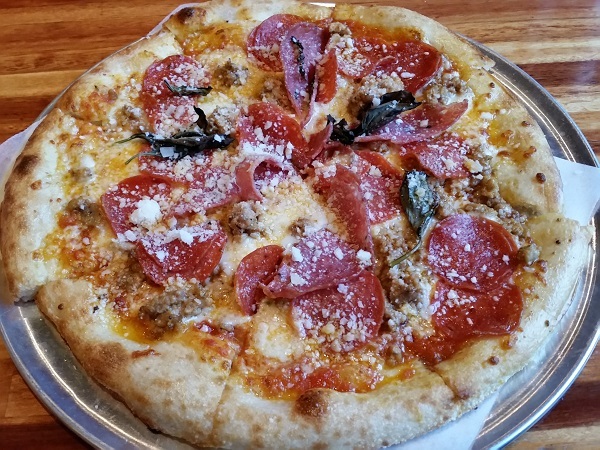 Posted on November 2, 2015 August 23, 2017 by Grant G.Posted in atlanta, georgia, modern american, pizzaTagged atlanta, brookhaven, gastropub, georgia, modern american, pizza.